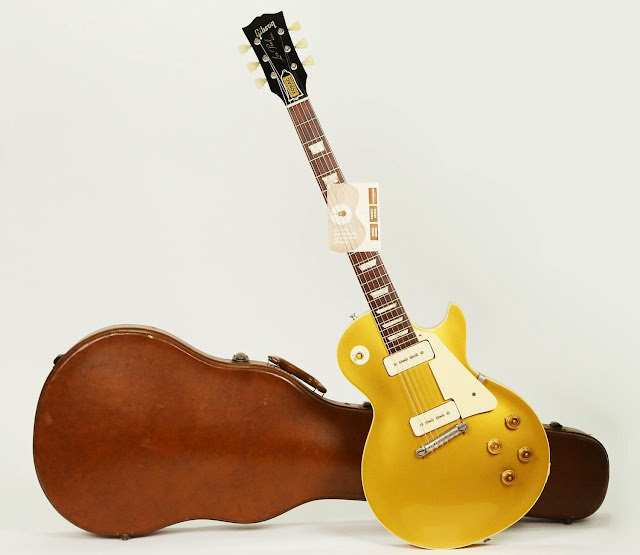 "For sale is this vintage 1956 Gibson Les Paul Standard electric guitar. 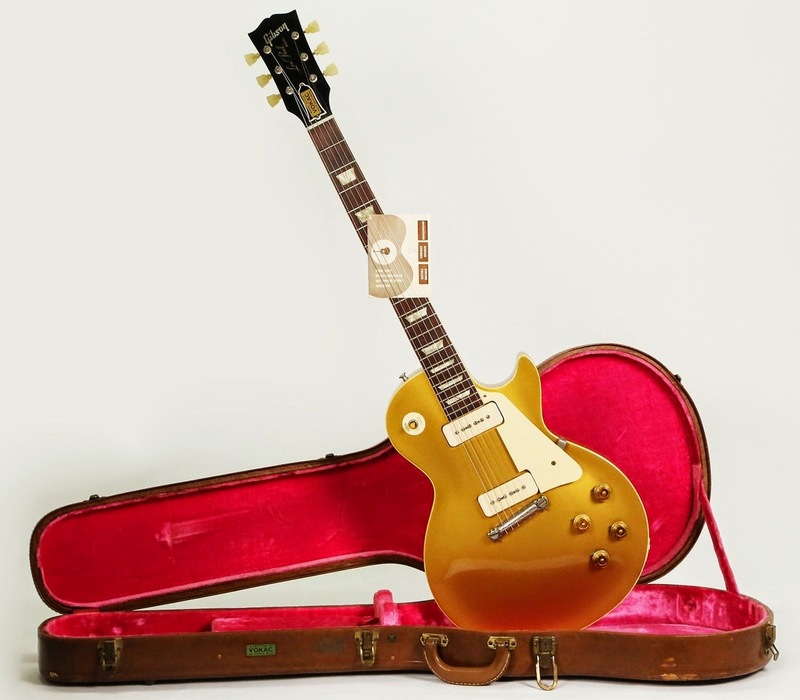 This extremely rare variety Gold Top, serial number 6 3892, is the absolute last of the wrap around (stop/stud) models, and was actually made concurrently with those produced with a tune-o-matic. This 100% all original example features an incredibly pristine all gold finish, the original case in comparable cosmetic condition, as well as, the original hangtag. 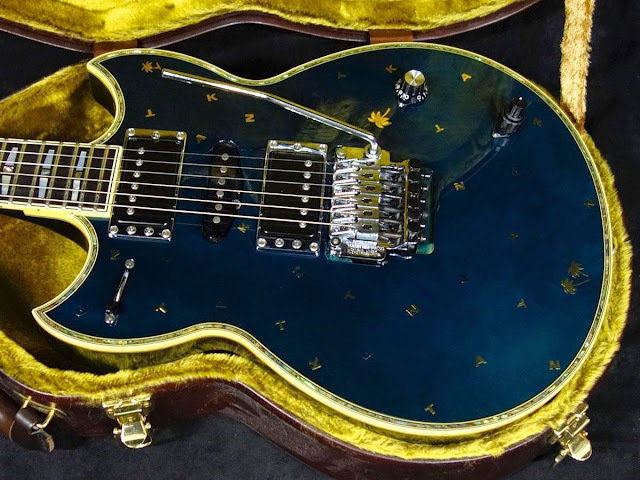 This is a very special instrument, and while there is another documented on pages 98 & 99 of The Early Years of the Les Paul Legacy: 1915-1963 it is highly unlikely that another opportunity will arise to buy one from this batch, let alone in this incredible condition. This auction includes Free Worldwide Shipping! Recently procured from the family of the original owner, this guitar was purchased new from the VOKAC Music House in Chicago in 1956. The decal from this store was placed on the truss rod of the instrument, inside the case, as well as, on the exterior. 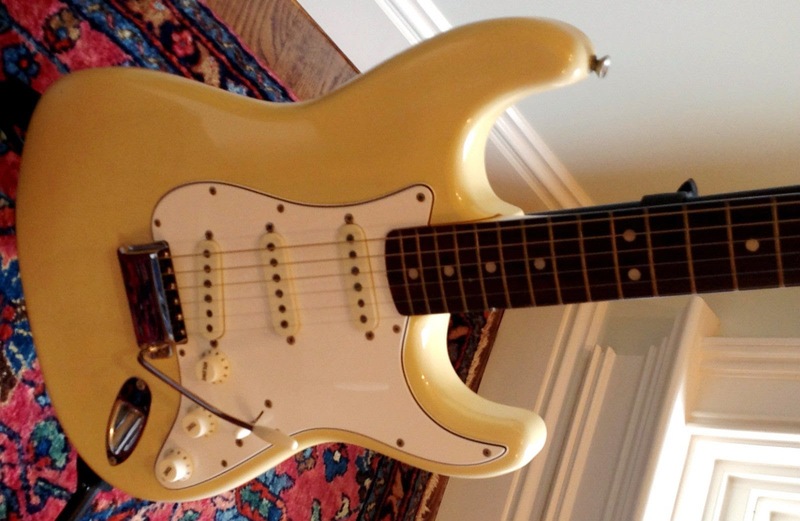 Seldom-used and always meticulously maintained, this guitar was enjoyed for a very short time, as evidence by very slight arm wear, almost no evidence of neck patina, and zero fret wear. It was safely stored within it's case, in a very temperate environment which only permitted the development of several very light weather-checking patterns. This is atypical of this era, as generally the weather-checking can appear thick and pronounced all over the entirety of the instrument, so to find one that hasn't been inordinately aged by deep checking is a rarity. Unfortunately, as the guitar sat for over 45 years within the case, the neck pickup volume pot became frozen, and I am not inclined to lubricate nor adjust it. So that will need to be addressed. As previously mentioned, this ’56 Gibson Les Paul Standard is in very excellent 100% all original condition. This glorious GoldTop features; an all gold finish, a 1-piece mahogany body with a hand-carved maple top, a mahogany neck with a Brazilian rosewood fingerboard, original frets and nut, no-line Kluson tuning machines with plastic tulip buttons, (2) P-90 pickups with cream plastic (UC-452-B/UC-452F) covers, a wrap-around stop tailpiece, gold top hat control knobs, brown plastic cavity cover plates, all original Stackpole pots, the original 4-latch Lifton case with pink interior with case key, the original "Les Paul" hangtag, and even the original wrap around bridge adjustment tool. Not surprisingly, this guitar feels absolutely amazing. The medium-sized very round open-C neck profile shape is perfect, a the fret life enables easy and fast action. The real surprise is how good this guitar sounds: the neck pickup is so remarkably balanced, that the highest notes on the fretboard are the same exact volume as the lowest. It intonates extremely well, and it is simply a very beautiful sounding instrument, easily one of the best Gold Tops I've ever heard. 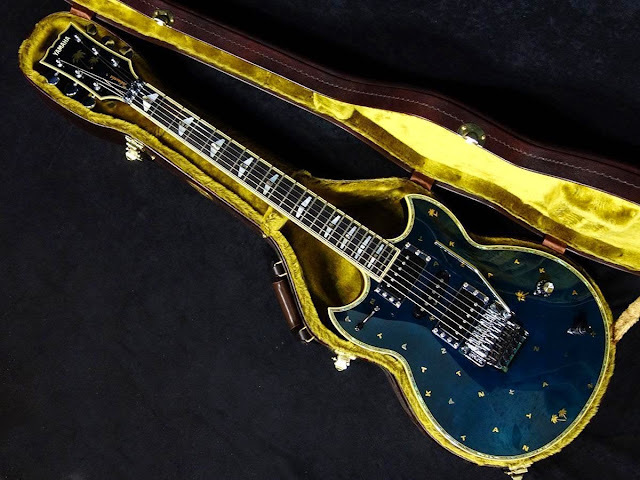 Don't miss out, this is one of the coolest vintage Les Pauls I've ever had the pleasure of owning." 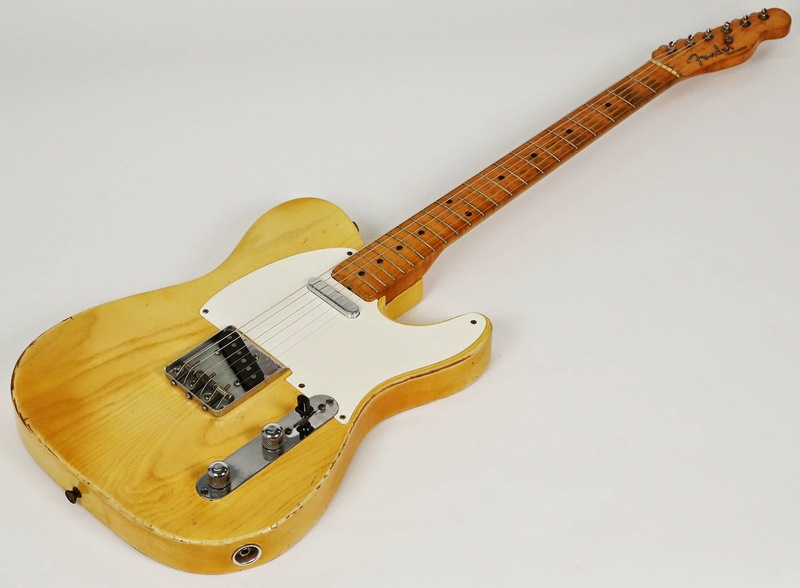 "For sale is this vintage 1954 Fender Telecaster electric guitar. This particular 100% all original example, serial number 7813, is a rare transitional variety that features the early style flat pole piece bridge pickup (just like those found on early Black Guards), in addition to belonging to the first year of the white pick guard era. Many have always considered early White Guards to be the obvious Black Guard bargain, as the differences between a '53 and this '54 are subtle and entirely superficial. A nice '53 Tele just sold for approximately $35,000.00 on eBay, and there are several others with serious finish problems being advertised around the $26,000.00 price range, so don't delay, because this '54 Tele deal is a steal at $23,900.00. Also, this listing includes Free Worldwide Shipping! 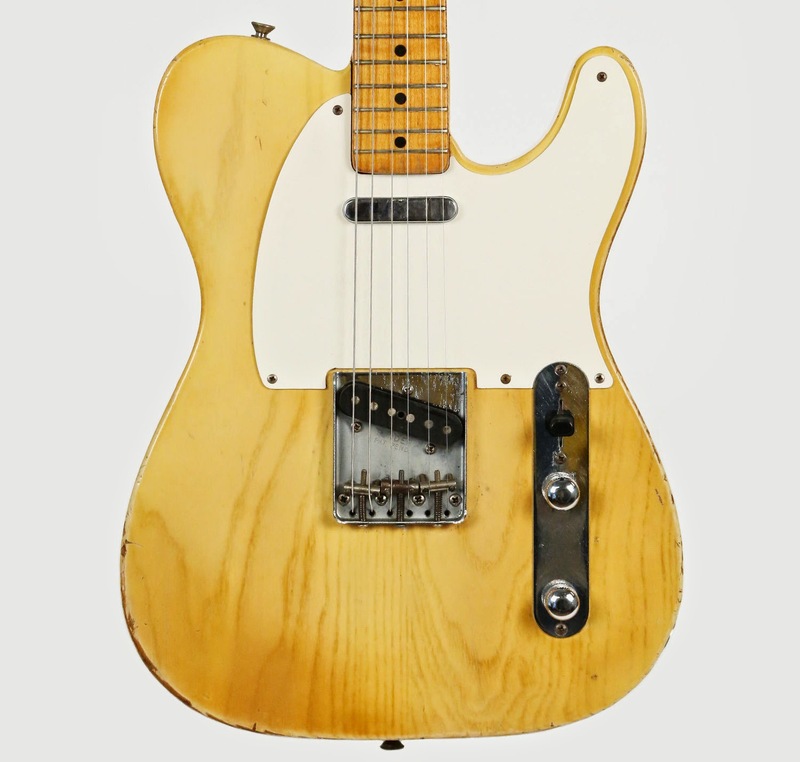 This '54 Fender Telecaster features; a 2-piece (center seam) Ash body with a butterscotch blonde finish, a very comfortable large deep C-profile maple neck with significant figuring and flame, original nut and frets, no-line Kluson Deluxe tuning machines, a 5-screw pattern white pick guard, a flat pole piece bridge pickup, original neck pickup, highly-domed knurled control knobs, non-serialized bridge plate with steel saddles, all original electronics, serial number on neck plate, and non-original reissue thermometer case. An all-around fantastic instrument, this guitar plays and feels like the best Black Guard I've ever owned. The large neck shape feels great regardless of personal preference, and the pickups sound absolutely remarkable. Highly balanced with incredible output, the bridge pickup exhibits both quintessential Tele twang and highly musical bandwidth. 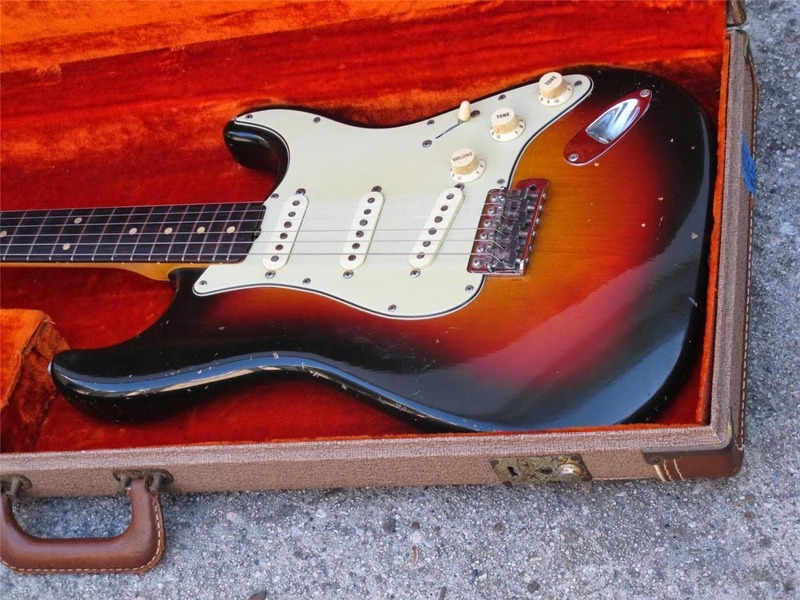 With a very attractive patina and an understated mild mojo, this guitar looks beautiful. There are no cracks, no breaks, and no repairs. The guitar does not display an inordinate amount of buckle rash nor neck/fret wear. With enough vibe to make this Tele fun to play, but most certainly not too much." 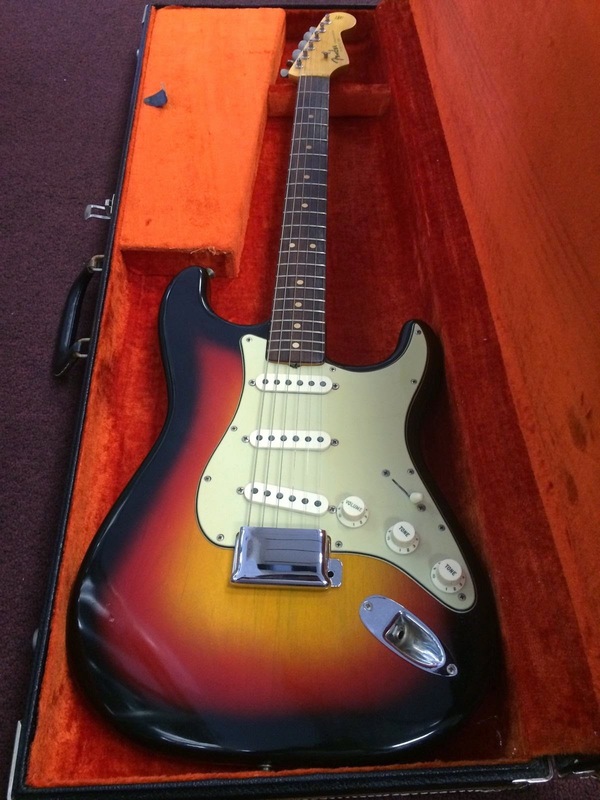 "Fender American Vintage '64 Stratocaster Electric Guitar, Rosewood Fretboard, 3-Color Sunburst, very good condition, all original, alder body, 7lbs, 6oz. The Fender 1964 Stratocaster features the L series neck plate, hand wound pick-ups, C-shaped maple neck, hand picked rosewood fingerboard with 7.25" radius, original contour body. Serial number is L28866 and have original receipt." "Viva Las Vegas! 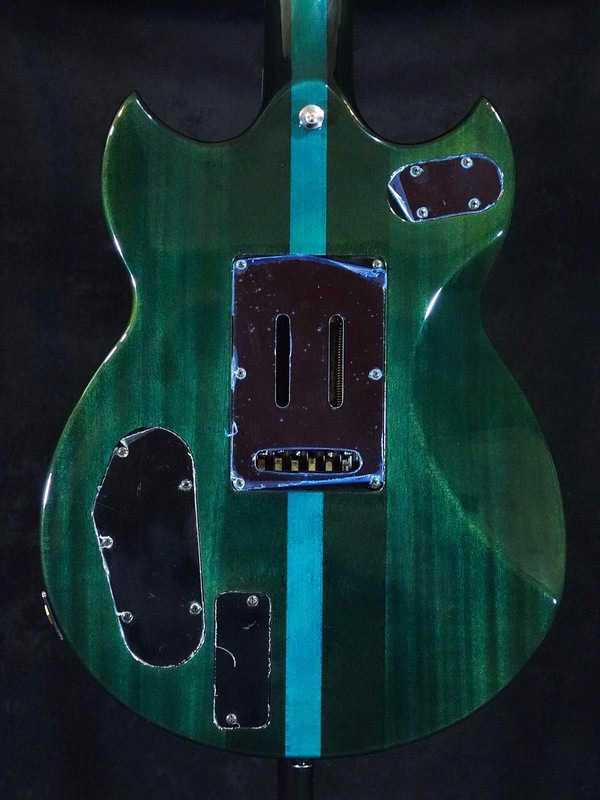 Today we have a hand painted and crafted masterpiece from the Burger Guitars Custom Shop. 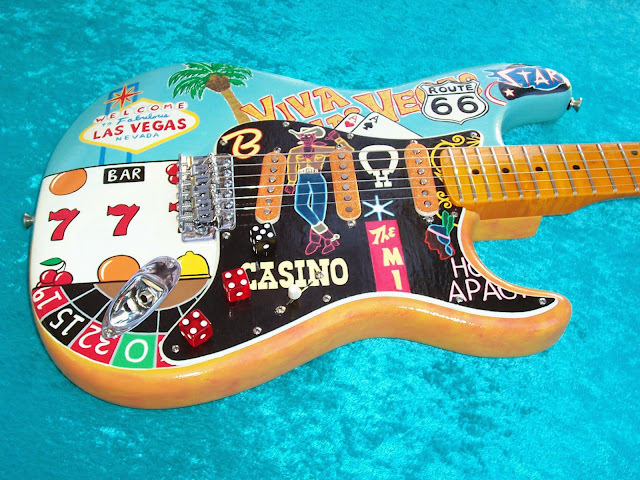 Let me introduce you to The Vegascaster! 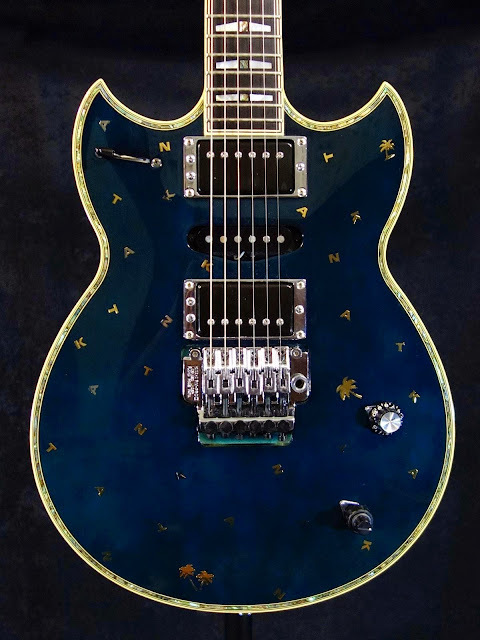 Every component was hand selected to create the ultimate Vegas tribute guitar. The body is a 2002 USA alder body with vintage style bridge and the neck is a custom ultra flamed maple with vintage tuners. All the electronics were hand wired in shop nd is signed and dated. The paint job highlights the Vegas welcome sign, Historic route 66, The Stardust Hotel and Casino, vintage slots, pocket rockets, a roulette table, and Viva Las Vegas from the film of the same title. The pickguard brings you to the classic old downtown area of Fremont street with The Horseshoe Club, The Mint, The Golden Nugget, Hotel Apache, Binions, and of course, Vegas Vic! The dice knobs add to the charm and are fully functional. The pickup covers are sparkly to emphasize the glitz of Fremont Street. The back features the "Drive Carefully, Come Back Soon" reverse side of the famous Vegas welcome sign and a custom engraved BGV001 neckplate. The guitar also comes with a signed certificate of authenticity. As you can tell, weeks have gone into creating this incredible piece of playable art. The guitar plays and sounds great and would be perfect for a professional musician, collector, hotel, casino, club, you name it! Worldwide shipping is available. I have painted 1000's of guitars for famous musicians, collectors, and musicians, and museums around the world." 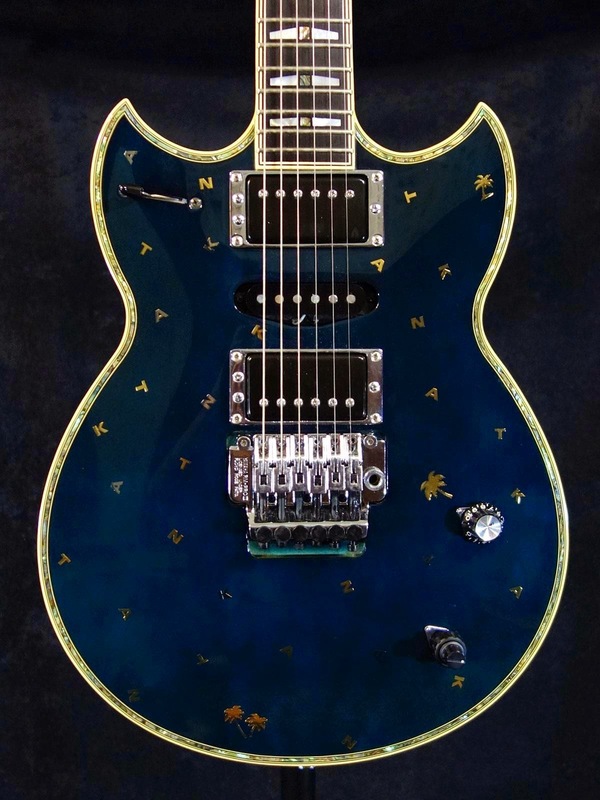 YAMAHA SG-T2 that is popular among other TAKANAKA model. Screw holes of the base plate for receiving the nut and screw groove of the nut for fixing the tremolo arm has got crushed, you will not be able to fix the tremolo arm, but the hardware and fine abrasion associated with the store the other in the dirt about, protection of plastic back panel also not been peeled off, one very valuable state nearly dead stock!" This is one of the best examples of this guitar we’ve seen in decades. This 1963 National Valpro Map guitar, is in absolutely 100% original condition, and is in incredible shape for a guitar of this age. This gorgeous museum quality piece a is a 1963 National Glenwood 98 guitar in outstanding original condition! Featuring two HOT single coil pickups, which offer three distinct tones using the Switchcraft 3-way switch, with volume and tone controls for each. Beautiful Res-O-Glass full map-shape body with minimal cracks around the output jack, cool diamond fingerboard inlays, Bigsby trem, and more! The neck is straight, the neck angle is perfect, and this one has LOW action all the way up the neck! Tones range from smooth to outrageous... just great! One of the coolest aspects of this guitar is what it comes with. It not only includes the original amazing condition hard case, but also includes the original hang tag, post card AND original National catalog, which is in such amazing condition we thought it was a reprint at first, but is 100% ORIGINAL!!!! These catalogs alone just DO NOT exist in this condition!!!! "The guitar was made, purchased, and stored in Southern California this entire time! The first thing you notice about the guitar is that it is in amazing, museum like condition! The parts are all original and have proper matching codes on neck and electronics to confirm the period and it's authenticity. 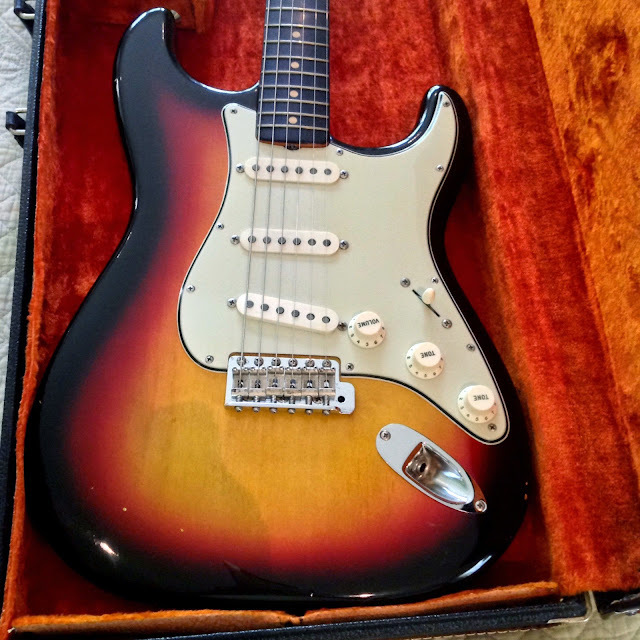 It has the 3 position switch, a Brazilian rosewood neck, clay dot inlays, 5 springs in the tremelo cavity, the original coil style guitar cable, daisy style cleaning cloth, and original tremelo bar. 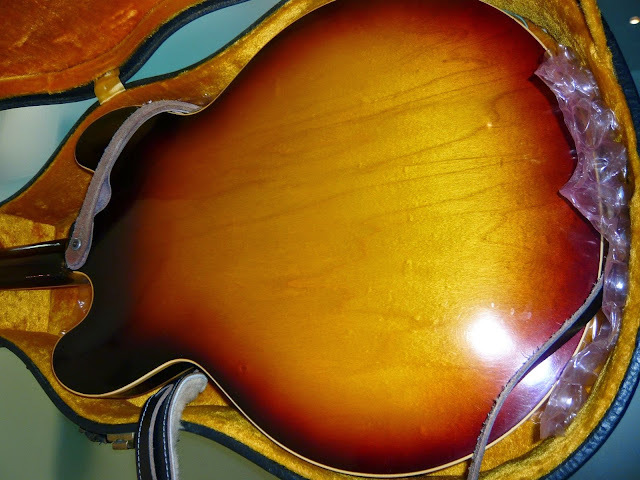 The guitar was purchased in the early Jan of 1964, and on the inside, it is stamped LPB. 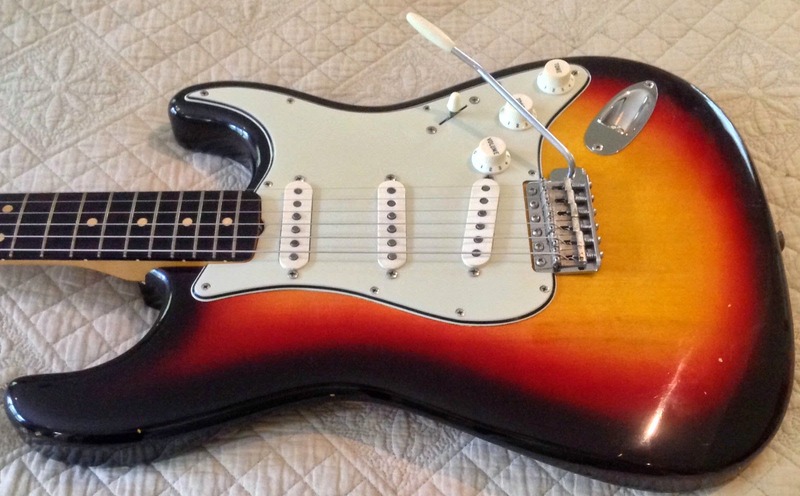 But for unknown reasons to his wife, he later had it repainted sunburst, at the Fender factory in the late 60's, or possibly the early 70's. The case is believed to have been purchased at that time, (because it does not have the 'tail' on the logo). We believe the case may have been purchased when they repainted the guitar, because he had the same case since then. 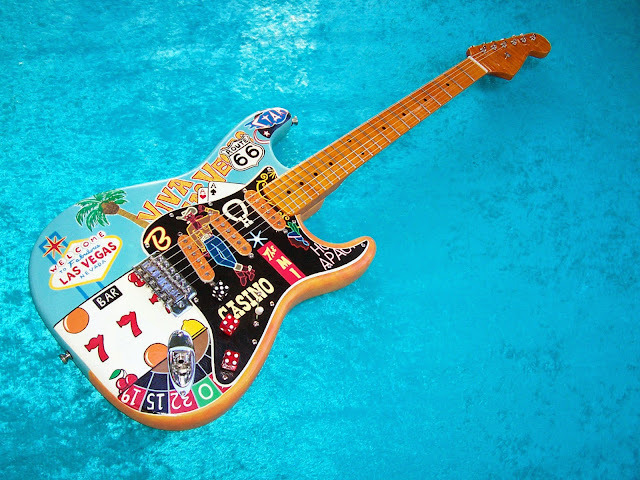 The Fender factory also placed a large headstock logo on the guitar, at the time of the repaint (we learned this was a common practice at the time), which has since been professionally restored to the original logo. Please examine the pictures for the specs and details. 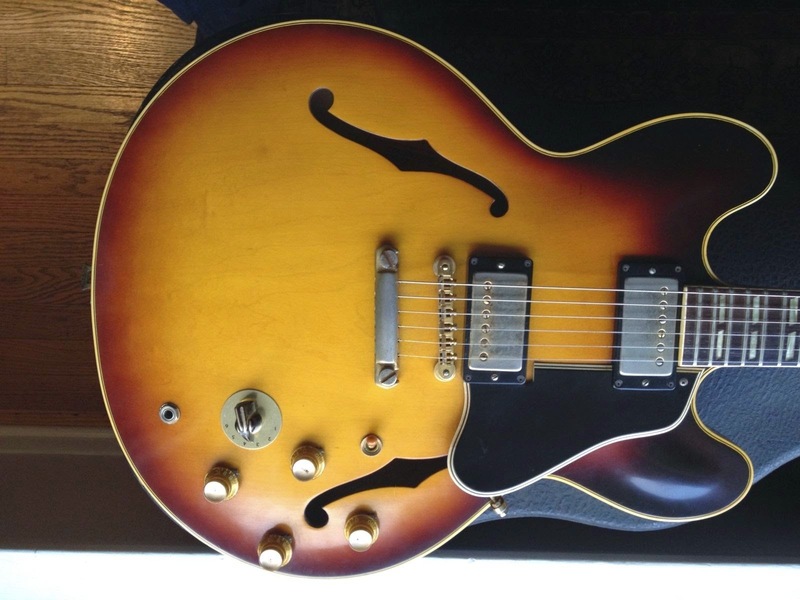 This guitar has been professionally set up and examined by two local experts and luthiers to confirm the electronics working condition and to verify the value..."
"Vintage original stop tail 1962 Gibson ES-345 Stereo in excellent condition. Plays great, sounds great. 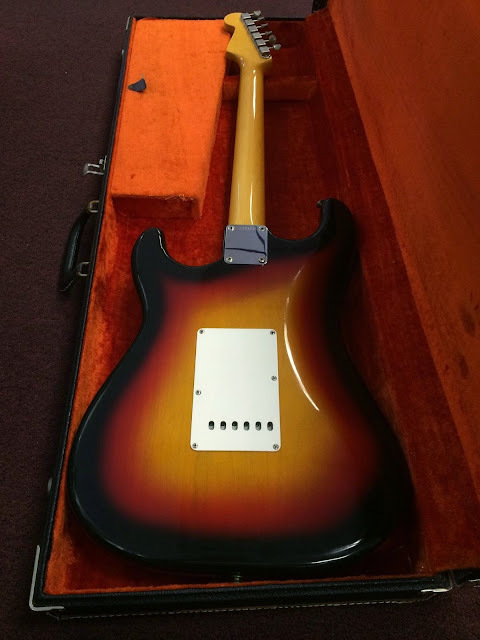 Original beautiful sunburst factory finish has no weather checking anywhere, no buckle rash on the back. 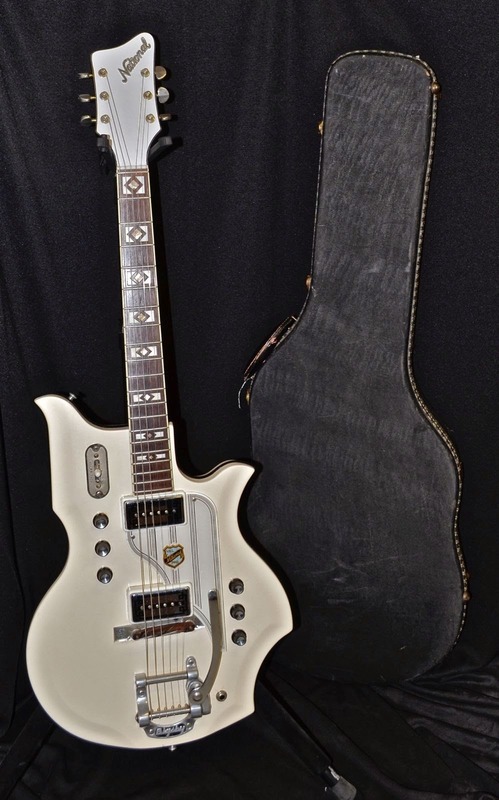 Origianal stop tail, never had a bigsby. Two original PAFs: Neck 7.62, Bridge 7.48. The sound is the perfect mix between power and fidelity. Mickey Mouse ears. Wiring, case, frets, stop tail piece, orange label, ABR-1, and finish, are all original. No structural problems, chips, cracks or scratches. Very little wear; and even the headstock edges look incredibly fresh. 102 sunburst 345s were made in 1962, most with bigsbys. It is rare opportunity to find an original stop tail, let alone, one in this condition. This guitar was played, well cared for, protected, and unmolested. My tech is a specialist in vintage instruments, has carefully inspected the guitar. The only items that are not "completely original" are: 1. The tuners on the guitar are replacements. The original tuners are included. Nothing has been drilled or routed. The old tuners with a couple of shrunken and cracked buttons, came off, the replacements were slipped on, & screwed down. 2. Like most ES's with nylon bridge saddles, they were replaced over time. 3. One pickup cover was off and has been put back on professionally, 4. A small section of binding on the neck came loose around the 2nd and 3rd frets. It was glued back on. A small amount of lacquer was applied to smooth out the edge that remained, and buffed out. There is some normal playing wear in the finish and fingerboard, around the 2nd and 3rd fret. The rest of the guitar is astonishingly clean. If you would like to see anything in greater detail, please ask for additional photos. 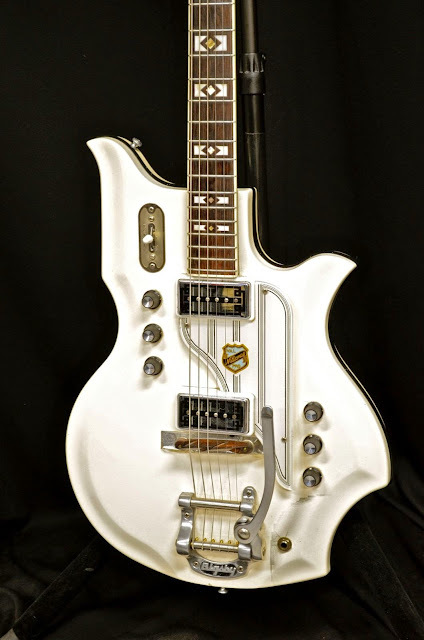 The ES's were a work in progress and went through minor changes over the first years, and many people believe these early 60s guitars were the best and most consistent. It has a typical 62 neck profile which has a little more meat and depth than the typical thin 60s neck, and a little less that the bulbous 59 necks. It weighs approximately 8 1/2 pounds. This is the cleanest and most reasonably priced straight PAF equipped 345 for sale. Don't pass it up. Prices are steadily rising again. At less than half the price of a similar year ES335, you can own one a golden era Gibson ES with PAFs in great condition..."